At The Mad Table, we’re mad for food that is both healthy and delicious. As you likely know, a diet rich in fruits and vegetables is generally lower in calories (most fruits and veggies are naturally low fat and calories), and fruits and vegetables not only add flavor, texture and color to your plate, but they also reduce disease and are packed with vitamins and nutrients vital to nutrition and a healthy mind and body. Here are some tricks and tips we use at The Mad Table for eating more fruit and veggies and enjoying every minute of it. * Your parents taught you not to lie. Meanwhile, mom was sneaking vegetables in your chili! It’s actually easy to tuck veggies in the most unexpected dishes. No one will notice finely chopped zucchini, carrots, parsnips or spinach in a turkey burger. 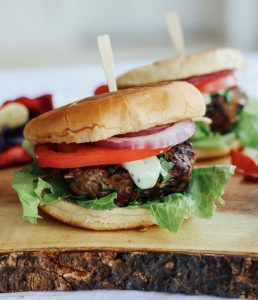 And don’t forget to top that burger with a healthy tahini or tzatziki sauce and include a homemade bun. You can also put diced veggies in soups or pasta sauces and no one will be the wiser. * Step up the flavor! You won’t get bored when you pack your vegetables with extra punch. When preparing vegetable dishes, use infused salts or flavor-filled spices like cumin to keep your taste buds on their toes. Make creamy purees with apples, carrots, celeriac/taro/yellow name/yucca root, garlic, mango or parsnips. * Don’t be afraid to break the rules. Take recipes that call for meat, like tacos or lasagna, and replace the meat with hearty vegetables like cauliflower or portobello mushrooms. Roast cauliflower and top with pesto and hazelnuts for a dose of delicious healthiness. 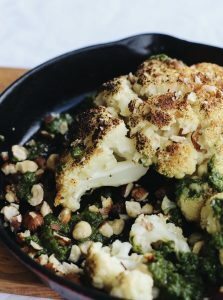 And add roasted cauliflower, broccoli, chickpeas, sweet potato, squash, eggplant and persimmons, pomegranate seeds and clementines to salads, tacos, spring rolls, wraps and grain bowls. Nuts or seeds add surprising textures and flavors, too. * Never overcook vegetables – keep them al dente. No one over the age of two likes a mushy carrot! And if you prefer crispy, raw veggies, dip them in red pepper hummus or baba ganoush. * Pan searing or grilling can bring out delicious flavors in vegetables. Think about the long line for roasted corn at your local street fair. Everyone wants a bite! Fire up the grill and roast asparagus, corn or Brussels sprouts, then toss them in a light vinaigrette or a bit of butter, ginger and garlic. Watch them disappear! 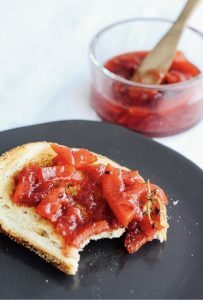 *Keep chutneys or jams made with unusual flavors and fresh bread on the table so that your family can experiment with new tastes. Use berries, mango, figs or beets and monitor what’s the first to go. They might surprise themselves by what they enjoy! * For dessert or breakfast, whip up the easiest hiding place for healthy veggies: a smoothie. In a blender, add carrot, cucumber, spinach or kale to your favorite berries, a banana, some yogurt, ice and honey. 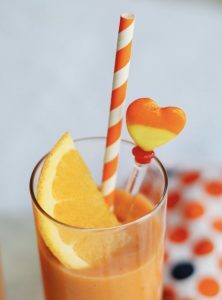 Blend and serve with a paper straw and a slice of orange. Watch their faces light up as they enjoy superfoods they didn’t know were mixed into these delicious treats! Remember that fruits and vegetables are critical to good health and longevity. They also contain antioxidants and can keep inflammation at bay. So pack your meals with fruits and vegetables – they’ll keep you looking and feeling your best! For more tips on cooking beautiful meals simply, don’t hesitate to find The Mad Table via our website. And be sure to like The Mad Table on Facebook and follow us on Instagram for all the latest news, fabulous recipes and gorgeous entertaining tips and ideas.